from the Steve Jobs Theater at the brand new Apple Campus in Cupertino. So we asked a few seasoned Apple watchers about their experiences covering Apple events. You attend a lot of events as a technology journalist but even the most cynical among us would admit that there’s something special about Apple’s launches. People talk a lot about the hype around Apple events but it’s honestly more than that - anyone who has been in the room knows that there is a sense of expectation and excitement ahead of the launch that simply isn’t replicated by any other brand. Many brands have tried their best to replicate that sensation, but I’ve certainly never been to an event that manages it and I think that’s largely down to the days when it was the late, great Steve Jobs strolling onto the stage with the latest Apple products. I wasn’t at the first few launches, and covering them remotely was always a fairly confusing time, being so far removed from the event and having to find information as it was dripping out. When the iPhone 3G came out, the big question was whether it would, well, have 3G… and the name pretty much gave that away. With the iPhone 3GS, the question was around a better camera (and, if you can believe it, a years-long desire to have ‘copy and paste’ functionality on an iPhone) - but these events were largely still curios in the tech world, a moment where fashion overthrew specs, which is what we all knew people really wanted to have in a phone. But the iPhone 4 was the moment when that changed - and that’s the launch I wished I’d been at. Steve Jobs telling people to turn off their Wi-Fi so the FaceTime demo could work… man, that would have been great to see. When you’re in the room though, an Apple event is a tough one to explain. What happens on stage is largely the same as with anything else, but the expectation from the room is just so much higher. 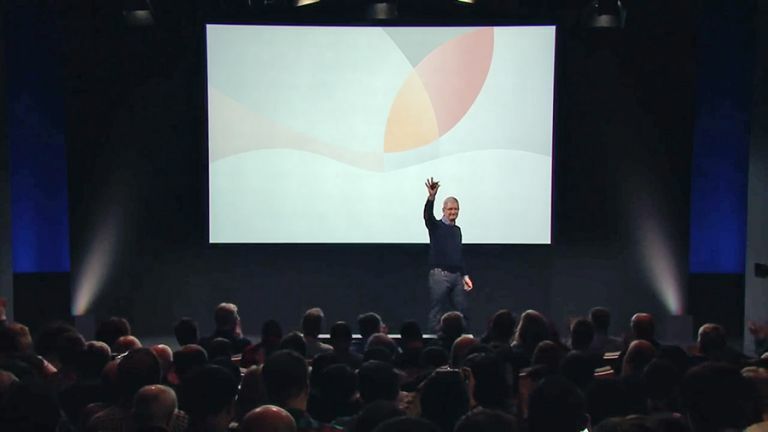 The world remembers what happens at an Apple event in far greater detail than any other, whether that be Scarf Guy, Eddy Cue’s shirts or Steve Jobs making a joke about the Gizmodo / iPhone leak. For me, the iPhone 6 launch was one of the most memorable. It went back to the Flint Center, the venue of a great many iconic Apple products, and had a much larger auditorium to house more people - and the brand even built a special structure to show off the new iPhone 6, its first phablet in the 6 Plus and the Apple Watch (which I was most intrigued to check out). What you don’t see from these events is just the pressure that’s everywhere - you need to pray for decent Wi-Fi to keep your connection strong enough to live blog, the sheer fatigue that comes from typing for 90 minutes straight and then the actual running that you need to do to get into the hands on area as soon as possible and begin fondling the products so you can bring a preview to the world as fast as possible. I’m genuinely looking forward to the iPhone X launch, simply because it’ll be at the Steve Jobs Theater and it’ll be a chance to see the new Apple Campus. It sounds dumb, but the impact Apple has on design means that you know the door handles will be worth looking at - as well as praying that the Wi-Fi is world-leading. I was lowly, green-around-the-gills tech blogger when I attended my one-and-only Apple event – and to this day I’m not sure how I managed to get an invite for one of the notoriously-oversubscribed showcases. Perhaps it was because it was for a relatively-minor launch – the iPad 3, aka 'the New iPad' and then, eventually, just 'iPad' - since then, of course, there's been another 'new iPad'. But even without the giant buzz you’d get with an iPhone launch, or a brand new product introduction, it was still something a bit special a feeling (rightly or wrongly) in the air that anything could happen, and anything could be revealed. It turned out to be a relatively prosaic launch for Apple – very much an incremental showcase – but the quality of the tablet then was undeniable. It was the first to bring Apple’s Retina Display to the tablet line, and even now it’s still a gorgeous screen to look at. It wasn’t quite what had been rumored though, which was the introduction of a haptic-feedback screen from then-newly-acquired Senseg, which was claimed to let you feel different materials and textures through the glass. It’s never been heard from since, but there’s always next year, right?